Welcome to a cocktail party hosted by poet Jill Dery’s parents, circa 1960. 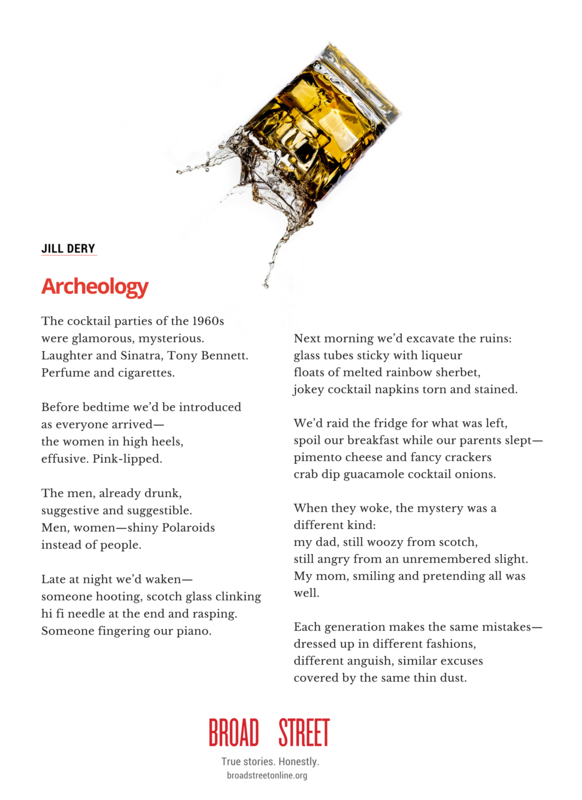 You can print out the broadside here–or scroll down to see the poem in plain format. May the spirit of Sinatra smile upon you. Laughter and Sinatra, Tony Bennett. hi fi needle at the end and rasping. jokey cocktail napkins torn and stained. crab dip guacamole cocktail onions. still angry from an unremembered slight. My mom, smiling and pretending all was well. covered by the same thin dust. Jill Dery has published stories in Bellingham Review and Fourteen Hills; she’s published poetry in Antiphon, SPRR, Windfall, and Penn Review, and she has poems forthcoming in Tule Review. Born and raised among the cocktail parties of Los Angeles, she’s lived in Anchorage, Alaska, since 1992. Previous postFrom Our Pages: "Prix Fixe--the table next to yours," by Thomas E. Kennedy. Next postTruth Teller Spotlight: Bryant Mangum, belle-lettrist, scholar, storyteller.